Do you want to support your favorite podcast but don’t have the spare cash to send them some coffee and cake money, back their Patreon, or buy some merchandise? Rating and reviewing your favorite podcast on iTunes will almost certainly help them out. 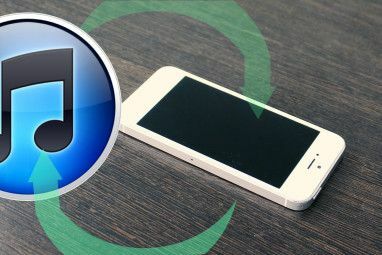 Here’s why, and how to leave a podcast review on iTunes and other podcast aggregators. Most podcasters make their shows as a hobby. Those that are fortunate enough to make money from podcasting do so because the show is part of a large media group or website, it has a generous sponsor, or they’re benefiting from monetary support from listeners. This might be in the shape of small contributions from listeners via PayPal, or perhaps through a Patreon subscription. Many podcasters enjoy success with Patreon How to Launch a Successful Patreon Page How to Launch a Successful Patreon Page In this article, we'll help you set up your Patreon page and give you a few tips to help you make it successful. Read More , offering exclusive bonuses, but it doesn’t work for every show. Fortunately, there are other ways to monetize creative content 4 Unusual Ways of Monetizing Your Creative Content 4 Unusual Ways of Monetizing Your Creative Content Are you a creative person? Perhaps you're a fiction author, or an investigative journalist? Monetizing your work is tricky. Here are four of the best ways to monetize content without an inch of advertising. Read More open to podcasters, giving you plenty of opoortunities to support your favorite shows. If your favorite podcast doesn’t use Patreon, doesn’t have a donate button, and isn’t supported with adverts or a big media company, what can you do? 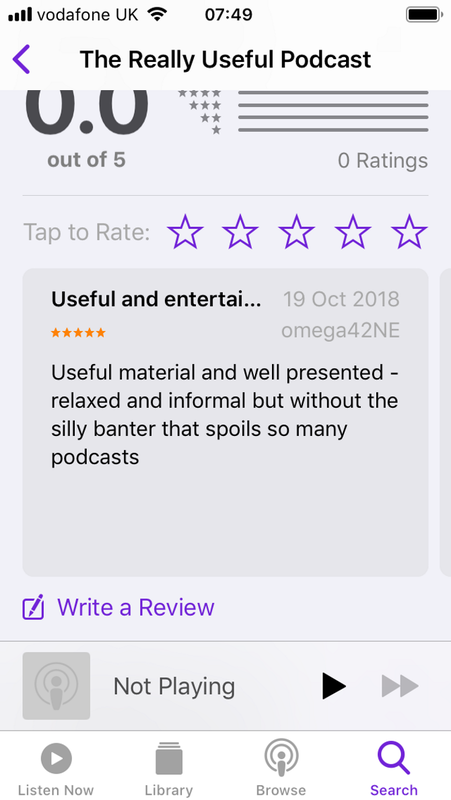 Well, if there’s a podcast you really love, simply leaving a review can have an impact, and perhaps attract new regular listeners. While the idea of leaving a review might be new to you, it’s simple, once you know how to get started. Although many podcast aggregators don’t support reviews, Apple’s iTunes Podcasts app and rival service Stitcher both do. 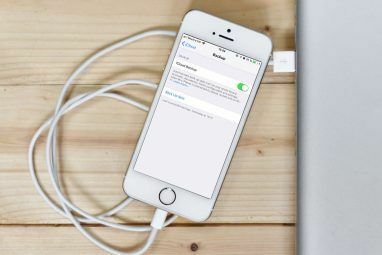 You may think that the way to review podcasts on iOS devices like the iPhone and iPad is via iTunes. In fact, you need to use the Podcasts app. This has a purple icon and should be on the first or second screen of your iOS device. 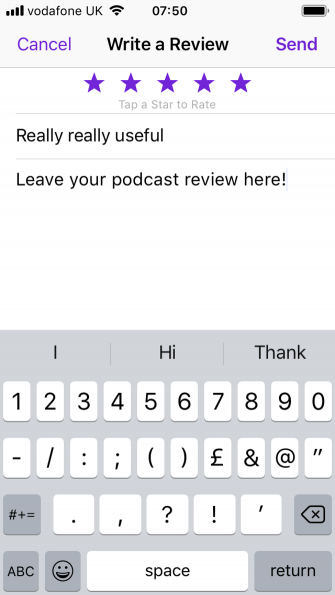 Open the app, find the search tool, and enter the name of the podcast you want to review. You’ll see the podcast’s logo (as album art), so tap this, then Reviews > Write a Review. Enter your iTunes password when prompted, then leave a star rating, a review, and a title. Tap Send, and you’re done. Before writing a review, it might be worth looking at other reviews from fellow listeners. This can be useful for finding well-regarded episodes of the podcast that you’ve missed so far. On Windows or macOS, you can use the standard iTunes app to leave a podcast review. Begin by clicking the drop-down menu to select Podcasts, then using the search box in the top-right to find the podcast you’re reviewing. The search results will typically display a list of recent shows from that podcast; scroll down until you find the large logo for the podcast. In the Ratings and Reviews screen, select a star rating under the Click to Rate heading, then leave a review. Don’t forget to include a title to summarize your thoughts (hopefully something that will encourage others to subscribe). When you’re done, hit Submit; you may be asked to log in again. When approved (because spotting fake reviews How to Spot Fake Reviews on Amazon How to Spot Fake Reviews on Amazon Don't trust that review or 5-star rating on Amazon to make up your mind about a product. The only way to find a true opinion is to learn how to spot these fakes. Read More is a skill), the review will appear on the podcast listing in iTunes. If you don’t use Apple products, you’re quite limited in how you can review podcasts. One place that does collate reviews, however, is Stitcher, a podcast aggregator that offers mobile and in-car podcast apps. To use Stitcher’s review system, head to the website at Stitcher.com and sign in. You can use an existing Google account, or Facebook, or simply create a new account. Once authenticated, search for the podcast you want to review, then select it. Scroll down to the foot of the page and click Write a review. 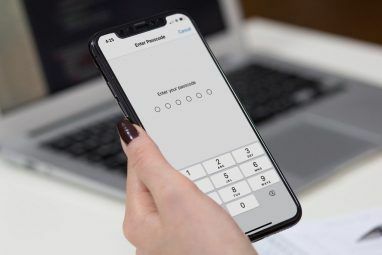 Here, set a rating, give your review a title, then input your thoughts. Click Post Review when you’re done, and once approved the review will be added to the podcast show page. Unfortunately, you cannot currently leave reviews using the Stitcher mobile app. iTunes and Stitcher aren’t the only places where you can rate podcasts. 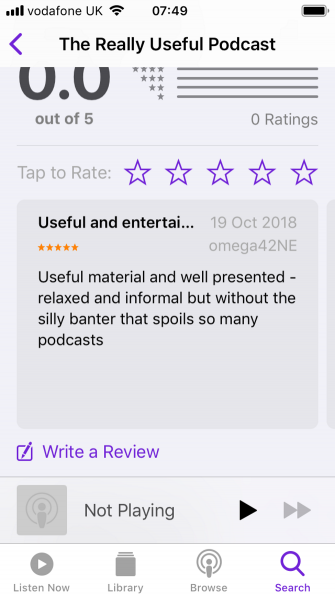 While review options are limited, almost every podcast app across all platforms lets you leave a star rating or add a “like”. Various podcast players for Android The 8 Best Podcast Players for Android The 8 Best Podcast Players for Android Want to listen to podcasts on your Android phone or tablet? Let us show you which apps to use. Read More offer this feature. The result might be quite different from leaving a review on iTunes, but it nevertheless gives the producers the encouragement they need. As podcasts go increasingly mainstream, however, this is likely to evolve. For example, you can easily share your appreciation for a podcast on social media by messaging the producers and sharing a link to the show. Meanwhile, other services are slowly moving into Apple’s territory. Rumors of Spotify starting a podcast rating system have been around for months. Should this be introduced it would likely change the podcasting world overnight. Similarly, if Amazon added podcasts into its media library, things could end up very different. Whatever the future holds, remember that Apple currently holds all the aces. So please do take the time to back your favorite shows with a few kind words on iTunes or the Podcasts app. Supporting your favorite podcast with a rating or a few friendly words of encouragement to other potential subscribers is a great idea. Whether supporting a podcast with a review or rating will improve its standing in the iTunes chart, no one really knows. Apple isn’t saying, but there is enough evidence from podcasters to suggest that it probably helps. Looking for a new podcast to subscribe to? 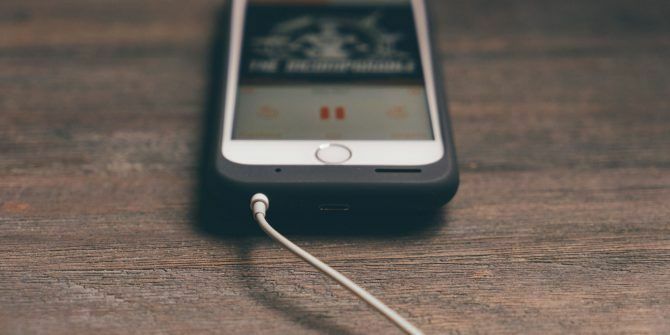 Here’s how to find great new podcasts What Is The Best Way To Find New Podcasts? What Is The Best Way To Find New Podcasts? Finding good podcasts takes some digging. Word of mouth remains the best way to discover the next great podcast. If the grapevines are silent, here are a few more ways to find new podcasts. Read More . Explore more about: iTunes, Podcasts.